Somnath Temple, Gujarat – Believed to be the primary jyotirlinga shrine on earth, Somnath is an important pilgrimage site for the Shiva believers or the Hindus. Located on the western coast of vibrant Gujarat, the Shiva temple is indeed a seraphic beauty that offers eternal tranquillity to its guests. A temple that got destructed and rebuilt several times, is built in such a location that one won’t notice any land surface in a straight line between the shore of Somnath until Antarctica. Isn’t this really fascinating? Such facts really make me believe that science and spirituality can surely go hand in hand. 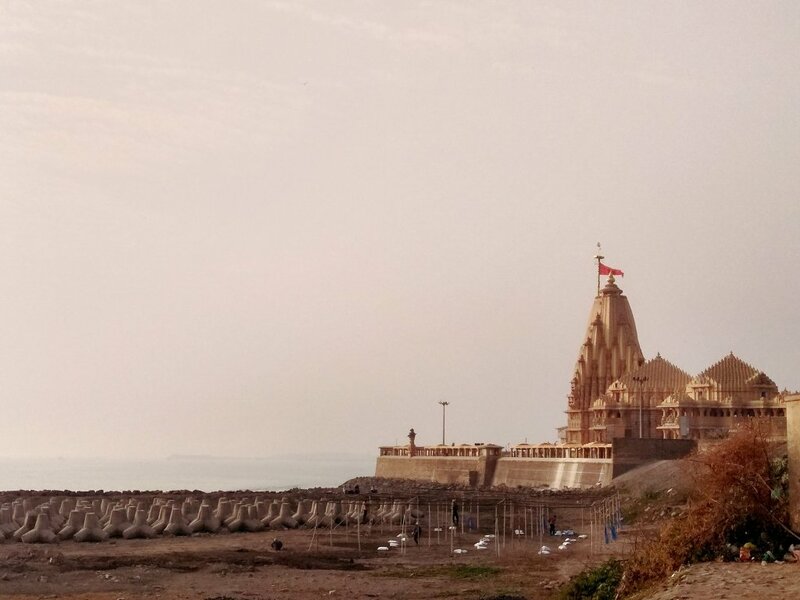 Somnath, which literally means the Lord of the Moon – “The Shiva”, is truly one of the rarest religious places of India which is so clean and unruffled. With its intrigue architectural style and exquisite carvings, the temple leaves you awestruck within your first glance. The humungous temple is built on a large space and welcomes millions of tourists every year. The temple not only accentuates its spiritual significance however has some compelling facts that draw the attention of its guests so effortlessly. Probably one of the fewest temples in India that has been managed so well by its trust and staff that surely attracts the travellers to visit the temple again and again. Such a clean and tidy travel destination is a rare sight these days and makes it so worth to visit. Offered with most of the essential facilities like clean washrooms and clean drinking water, the temple in true sense outstands the list of holy sites. Additionally, they ensure separate queues for ladies and gents that make it easy for the women visitors to travel in the rush time too. A beautiful garden to sit down and luxuriate in the serenity is an added bonus one can relish inside the temple. The temple has a separate counter for prasads and Ganga jal that can be purchased and also maintains a small office that accepts any sort of donation for the betterment of the Mahadev temple. One of the most visited Hindu shrines, Somnath town is believed to have witnessed the emergence of the first naturally formed jyotirlinga in our country. There are 11 other highly auspicious jyotirlingas located across India namely Kedarnath, Bhimashankar, Mahakaleshwar, Omkareshwar, Trimbakeshwar, Rameshwaram, Shrisailam, Vishwnath, Vaidynath, Nageshwara, and Grishneswar. The shrine is a paradise for the Shiva followers and attains supreme devotion and peace by its devotees. The supreme god is worshipped in the form of lingam here and has an interesting story about his foundation. It is believed that the temple was originally built by the Lord of Romance, Lord Moon. He was married to 27 daughters of Daksh Prajapati however, was more inclined and deeply in love with the youngest daughter Rohini. In absence of the love and affection they deserved from their husband, the other queens felt neglected and sought advice from their father. After several counseling and discussions, when no behavioral change was noticed, Daksh became worried and agitated. Apparently, Moon was cursed by his father in law for losing all his light and luster. After losing his charm, Moon was determined to worship Lord Shiva and took a holy bath in the pious Saraswati river. Seeing his supreme devotion, Shiva blessed him and released him from the curse to an extent which is why the various phases of the moon can be seen after the lunar eclipse. In return, Moon built a spectacular Shiva temple made purely of gold. One of its own kind is the light and sound show of the temple, that takes us through the history of the majestic Somnath temple. The show can be heard in the voice of legendary Bollywood actor Amitabh Bacchan and Paresh Rawal and has a 3D version which makes it distinctive. The temple has a huge amphitheater for its guests that gives an enchanting experience of sitting right at the center of the temple and enjoying the cool breeze of the beach. The show that gets a background sound of natural waves strikes right at the heart of the viewers. The tickets can be purchased inside the temple post the evening aarti and the show begins around 8 pm. The temple is constructed next to a gorgeous beach which is named after the temple and popularly known as Somnath beach. One cannot enter the beach from the temple as the pathways are covered with giant rocks, however, enjoying the sunset in such a mystical environment is absolutely breathtaking. Inside the temple premises, binocular views are also available which helps you in spotting few small Shiva lings emerging out in the ocean. Probably one of the affluent built, this temple has an amazing history that surely deserves an ear to hear. Primarily due to the wealth attached to the temple, it got looted and destructed several times by the Muslim leaders including Alauddin Khalji, Aurangzeb and Zafar Khan (to name a few). Considered as one of the wealthiest temples, it was also destroyed by the Portuguese in 1546. The Somnath temple was reconstructed after each time it got demolished and eventually was built on the initiative of the iron man of India, Sardar Vallabhai Patel in 1950. If believed to the story of the local tales, the Somnath temple was originally built in gold by God Moon, then in silver by Lankapati Ravana and then in wood by Lord Krishna. The stone built took place many years later by Bhimdev. 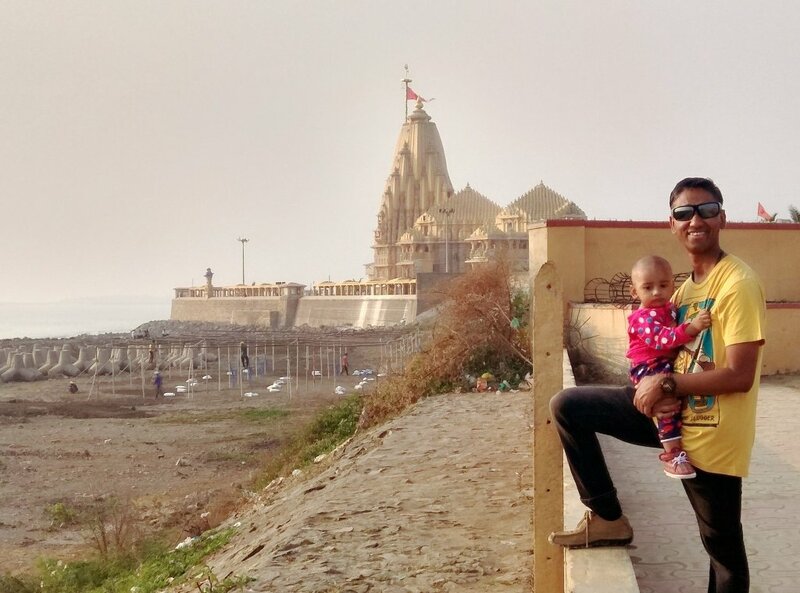 Although, the Somnath temple is always so beautiful and serene to experience, however, the beautiful festivals including Mahashivratri, Navratri and Kartik Purnima takes the beauty of the temple to a different level. The countless devotees dance in complete madness and devotion and enjoy the 4 day fair that happens during the Kartik Purnima time. Other than the holy Somnath mandir, Bhalka Tirth, Panch Pandav Gufa, Gita Mandir, Lakshminarayan mandir and Somnath Museum are few other attractions that can be added to the travel itinerary. Diu – To experience the flavors of Goa and Portuguese, one must pay a visit to the gorgeous island of Diu which has a collection of exotic beaches, naturally formed caves, unique shell museums and beautiful churches to please its guests. A drive to this eccentric beauty is of 2 hours and offers beautiful sea views to adore. Please check out know more about Diu and things to do in Diu. Gir National Park – Additionally, the nature-loving travellers must plan a visit to the Gir National Park which is known as the abode of Asiatic Lions. The only natural habitat in India where one could enjoy spotting the King of Jungles roaming freely on the ground. The driving distance between the national park and Somnath is around 50 km and can be reached in an hour’s time. 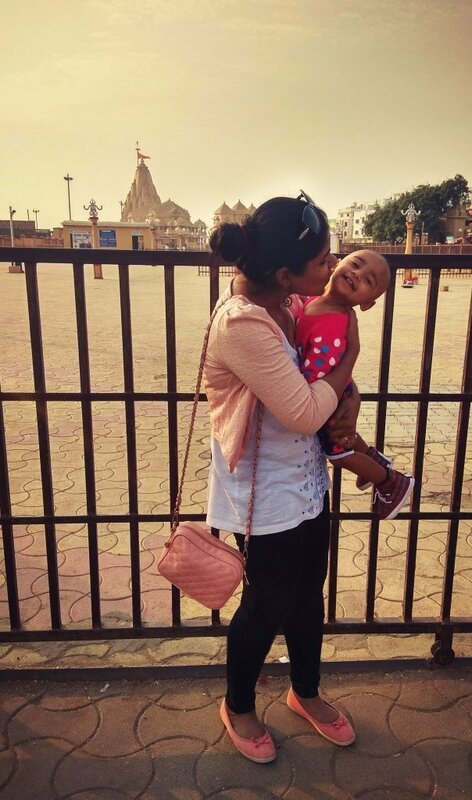 Dwarka – The gateway to Moksh, Dwarka is one of the most visited Hindu shrine popularly known for being one among the chaar dhaam. The beautiful town is believed to be formed by Lord Krishna to set up his mesmerizing kingdom, however, immediately after his demise, the city got completely submerged in water. The temple not only draws the attention of the Krishna believers but is very much liked by other tourists due to its beautiful architectural wonder. The Dwarkadeesh temple is a true depiction of divine beauty and completely blows your mind by the well organized arrangements. The fastest way to reach Dwarka from Somnath would be a road journey which could be covered in approximately 4 – 5 hours covering a distance of 230 km. Alternatively, one could avail the direct train journey that would take nearly 8 – 9 hours. Train Journey – The nearest railway station is in Somnath itself making it really convenient for those who choose to travel by train and is merely 7 km away. Flight Journey – The nearest airport is the Diu airport situated in gorgeous Diu island and is nearly 63 km away from Somnath. It nearly takes 2 hours to reach the specified location. Alternatively, one could choose a road journey from Ahmedabad airport covering a distance of 423 km which would nearly take 7 hours and 30 minutes or from Porbandar airport which is 114 km away. Road Journey – As we live close to Ahmedabad, we chose to drive on the wonderful roads of Gujarat and reached Somnath in just 6 hours. The roads were honestly very comfortable to travel with my 1-year-old girl and could find plenty of places to take a quick halt for refreshments and lunch. Gujarat is anyways a hot state and summers are extremely hot to experience. So, our recommendation would be to travel somewhere between September to February. The temple is open for its visitors from 6 in the morning to 8 in the night. Those who want to enjoy the darshan aarti, can visit the Somnath temple for the morning Aarti that takes place at 7 am and 12 pm and evening Aarti’s time is 7 pm. The guests can avail the guest rooms maintained by the Somnath Mahadev temple trust which has nearly 200 rooms for this purpose. The rooms range from VIP rooms to economical dormitory. With thousands of guests visiting this spiritual town on a daily basis, the city too is well equipped with a variety of hotels and guestrooms near the temple as well as within the city. Please wear proper clothes – The temple authorities are very strict about the clothes one wears before entering the temple. They strictly discourage any kind of inappropriate clothing. Even shorts worn by teenagers or gents are not entertained in any circumstance. Separate counters to keep the belongings – One is only allowed to carry your wallets or small hand purse and other than that any sort of digital equipment, care keys, luggage or handbags are strictly not permittable to carry along. One could either choose to leave their belongings at their room, car or the counters available outside the temple. Photography strictly prohibited – As most of the popular and sacred places of India, photography is not allowed inside the temple. Hence, one has to keep their cameras or phones in the counters available outside the temple or leave them inside your hotel room or car. However, I would really recommend you to carry your cameras or phones till the deposit counters as one could enjoy clicking pictures of the gorgeous sunset at the seashore next to the temple and also the outside of the temple. One could also spot local photographers outside the mandir who can click your pictures at a nominal cost. The parking area is far – The parking area is approximately 10 – 15 minutes away from the temple so wearing comfortable footwear will make your journey much better. One may like to seek special permission from the Somnath trust authorities if travelling with old people. Separate counters for shoes – Shoes can be kept in separate counters which are available inside the temple premises. Puja Samagri – Any form of dhoop batti or coconut is not allowed in the temple however one could purchase some fresh flowers and bel leaves from the local vendors available outside the temple. Shopping – Gujarat is famous for its Patola sarees which can be easily available in the market outside the temple. The market is also filled with many sea shell collections, jewelry made of shells and Mahadev’s damru and shivlings. 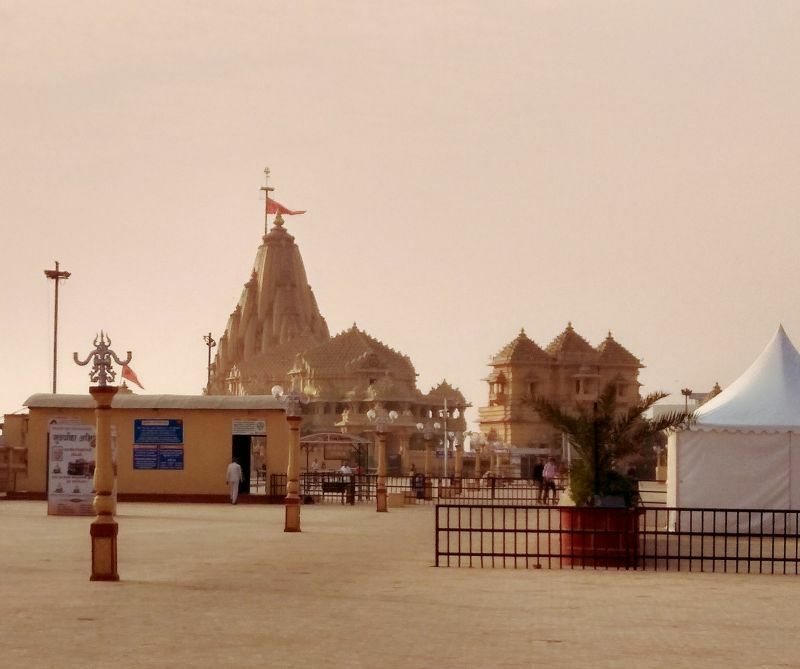 With so much of serenity around, Somnath Mahadev temple is a must to visit place in Gujarat. One of the cleanest and well-organized temples across the county, the temple is a beautiful masterpiece that cannot be explained in words. The temple’s unique 3d affected light and sound show surely needs applause for showing the complete history of this holistic place. Let us know if you found the article on Somnath Mahadev Temple interesting and useful? by leaving us your valuable comments and by rating us by clicking the 5 stars.